I caught a plane from SCI in Reno NV, headed north to the Washington Sportsmen’s Show in Puyallup Washington. It was drizzling rain, perfect weather for any outdoorsman, woman and child to get inside. With this being Western Washington’s only sportsmen’s show, you can imagine how packed every aisle was. The show features seminars, camp cooking demonstrations, a trout pond for kids to fish for free and the sportsman’s favorite “Head & Horns” competition. Folks from all over Washington state came to book hunts and trips with professional guides and outfitters. For me, this event was all about the meet and greet at the Cabela’s booth. I had a great time all day Saturday taking pictures, talking hunting and signing autographs for the seemingly non-stop stream of attendees. Unfortunately, on day two of the event, I had to tuck out a few hours early due to some sort of food poisoning to spend the next 15 hours in my hotel room flat out on the bed. I was hoping to make it through trade show season in good health and nearly did. 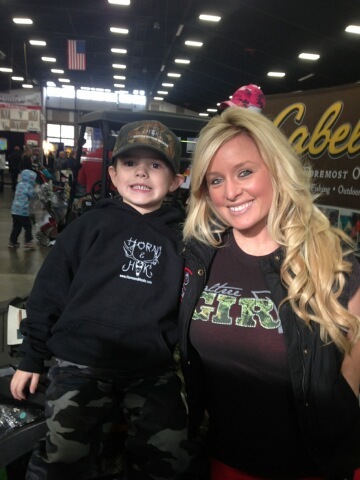 This girl bit the dust at the Washington Sportsmen’s Show.